Do you prefer to use real dice, a dice application or program, or use a diceless system? 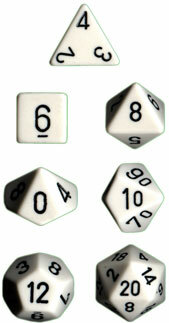 In play, I prefer real dice and both five sets of the Chessex white dice with black numbers. They are easy to see for these old eyes and no one else I game with seems to use them. While doing stuff for the blog or making characters on my Macbook, I use Wizard of the Coast's Dice Roller. While I am a big fan of systems where the Game Master doesn't roll (Cypher System, Cinematic Unisystem, the forthcoming Unity RPG), I am no fan of diceless systems.